• Brittany Dyer of American Forests and co-chair of the State’s Tree Mortality working group presented an excellent historical overview on how the Sierra counties affected by tree mortality responded and urged the governor to declare the tree mortality disaster. • Latest data indicate that there are 149 million dead trees in California, up from 129 million last year. • In the Sierra Nevada, the amount of new tree mortality increased in a north to south direction based on sampling conducted in 2017. In 2018, sampling indicated that new mortality has increased in the northern Sierra and decreased somewhat in the central and southern Sierra. The biggest decrease is in the central Sierra. • Mortality due to bark beetles has declined substantially over the past year. • Falling dead trees were studied with the highest rates of fall in white fir, followed by incense cedar and sugar pine. Ponderosa pine fall rates are lowest (one percent/year). Overall, 62 percent of dead trees fall in whole or part within three years. • There is evidence that wildfire severity increases if there is a combination of standing dead trees and dense forest stands. All the presentations from the workshop are now posted on the project web page: http://ucanr.edu/treemortalitynetwork . 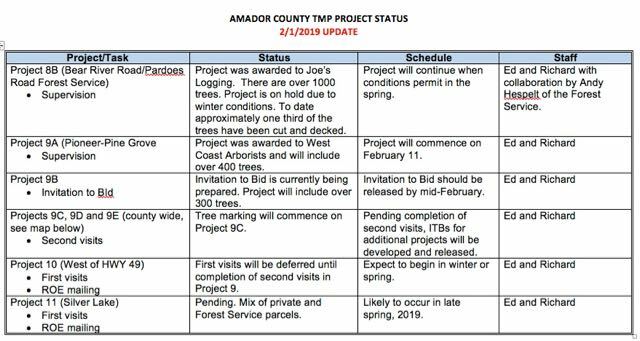 The table below summarizes current and pending County tree removal projects as of February 2019. Project 8A on Forest Service land along Bear River Road was completed in November 2018. Over 900 trees were removed. Project 8B on Bear River Road includes over 1000 trees but work has been suspended due to snow cover. Project 9A in the Pioneer area is underway and should be completed by the end of April. Project 9B in the Volcano-Pine Grove area is currently out to bid and should begin in late April to early May. Additional projects throughout the County are currently being planned. Governor Brown issued an Executive Order on May 10, 2018 directing state agencies to improve forest management and restoration, provide regulator relief, reduce barriers for prescribed fires, boost education and outreach to homeowners, and support wood products innovation. Read the Executive Order by downloading the document below. Over the past year six projects were completed. They involved the cutting and removal of 2135 trees. Two additional projects are underway, one on Forest Service land along Bear River Road (Project 8B) and the second in the Pioneer area (Project 9A). Project 8B has been delayed due to winter conditions and will resume when access is available. Project 9A has been awarded to West Coast Arborists and will begin in mid- to late February. These projects include 1485 trees. Four more projects are planned for the upcoming months. Along with Project 9A, they will encompass all County roads and private land east of Highway 49. The next project in the Fiddletown area will include 373 trees. An invitation to bid will be issued for that project within the next couple of weeks. 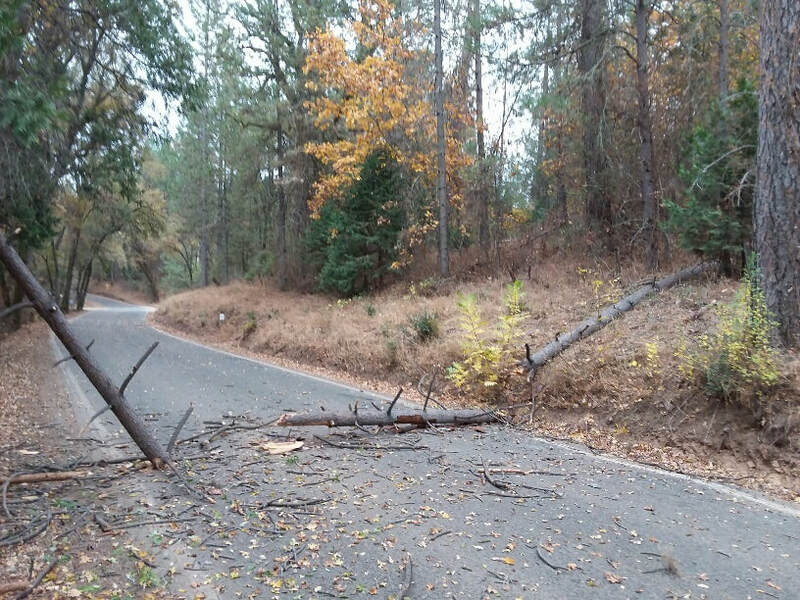 Right of entry forms were mailed to 649 properties where newly dead trees were located subsequent to the last round of projects. Of these 457 had been returned as of January 17 (70 percent). The right of entry form process is being coordinated between the County, Amador County Transportation Commission and TSS. The five projects underway or planned on private land over the next few months include new properties with newly dead trees as well as properties that participated in past projects and have newly dead trees. When all projects on private land east of Highway 49 have been completed, surveys will be conducted on land west of Highway 49 and on Forest Service and private land in the Silver Lake-Kirkwood area. Depending on the outcome of those surveys, additional tree mortality mitigation projects will be developed. All projects completed to date have been implemented with no serious damages to private property, very few complaints from property owners and no injuries to workers. All project costs have been reimbursed by the State Office of Emergency Services and CAL FIRE. To further public outreach, TSS has been provided with the ability to maintain and update the County’s tree mortality website. TSS is also providing periodic updates on the program through press releases. We continue to benefit from the technical assistance of County administrative and financial staff and Cindy Engel of the Amador County Transportation Commission. Without this assistance our projects would not be successful. PG&E has updated their debris management program. See the attached PDF for more details. See the attached file for an example list of commercial enterprises that receive logs and/or biomass material near Amador & Calaveras County. UPDATED! The attached file contains a list of contractors that will pick up and deliver logs on your property to the Ampine Facility in Sutter Creek to be made into particle board. Governor issues a declaration that allows both licensed tree service companies and licensed timber operators to bid on any and all projects, whether they involve commercial timber harvesting or not! The bins are only available for use by homeowners, not landscape companies. Amador County Tree Mortality Mitigation Geographic Information System (GIS) Maps have been posted! !